KARATE GI'S sold at the lowest price, Guaranteed. Karategi is the Japanese name for the karate training uniform. A karategi is somewhat similar to a judogi or (Judo uniform) as it shares a common origin; however, the material and cut of the uniform is generally much lighter and looser fitting. The heaviest of Karategi are only 0.45 kg (16 oz) compared to some judogi at 0.99 kg (35 oz). 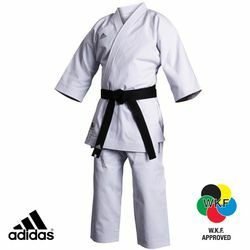 Because of the nature of Karate training which emphasizes striking, kicking and a more limited range of standing throws compared to Judo the karategi has evolved in a manner that maximizes mobility and speed without the extremely coarse and strong fabric required for grappling and throwing found in Judo. They are made from smooth cotton which may be brushed or ribbed for unrestricted movement and added comfort. Reinforced stitching is common, as to compensate for the stresses put on the gi. Inferior karategi are often cut from a light fabric similar to that of a summer shirt. These karategi are easily ripped, and tend to adhere to the practitioner's skin, creating some discomfort after any extensive perspiration is experienced. Such materials yield a karategi no heavier than the 0.2 kg (8 oz). Most quality karategi are cut from a light canvas style cloth because of its ability to stand up to considerable amounts of rigorous application and abuse without restricting the mobility of the karateka. Typically, such karategi weigh at least 0.3 kg (10 oz). We carry a wide selection of Karate gi's to meet everyones needs. Karate gi's are traditional style uniforms that are open in the front. We carry entry level gi's all the way up to your hi end uniforms. No matter who you are, we have something for you.